The Amalfi Coast is one of the most unique places in the world. Nestled in a peninsula south of the historic city of Pompei the mountainous region has forever been one of the most magical places in the world. 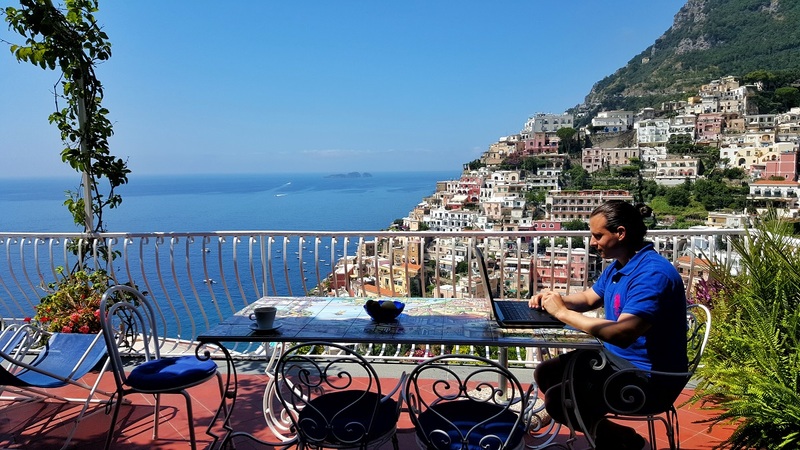 I was able to explore most of the Amalfi Coast on my recent trip to Europe and it certainly disappoint. The name of the city that provides these amazing views is called Positano. It will be hard to find a hotel with this kind of view during the peak months of July and August. Would recommend visiting in the months of May or July to get great shots like the one above. I’m from Medellín – Colombia and I’ve watched some of your videos on YouTube, and I got to say that It’s amazing. I really like your life style. I like the trading, even I use to trading online but I think I should learn more about it. I want to become on your student. Please tell me what should I do to be your student. Hi Marcelo, what type of Laptop you recommend for trading while travelling?